An excellent vegetable mix that goes wonderfully well with paranthe or rotis. For more recipes related to Baingan Shimla Mirch aur Tamatar ki Sabzi checkout Bharli Vangi, Eggplant Chilli Garlic, Achari Baingan, Baingan Bharta . You can also find more Main Course Vegetarian recipes like Waterchestnut and Mushroom Stir Fry Chauli Ussal Oi Sobaegi Sai Bhaji. Heat oil in a non-stick pan. Add carom seeds. When they begin to change colour, add ginger-green chilli paste and sauté for 30 seconds. Add pureed tomatoes and sauté till oil separates. Add turmeric powder, chilli powder, coriander powder, cumin powder, sugar and salt. Sauté for 1 minute. 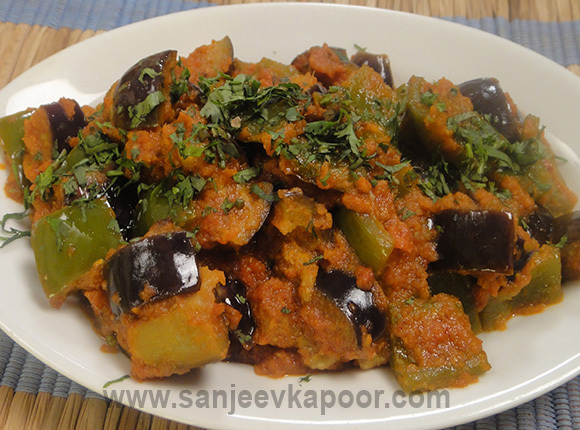 Add brinjals, capsicums and sauté for four to 4-5 minutes. Add 1 cup of water. Cover and cook on low heat for 8-10 minutes or till the vegetables are cooked.